Cincinnati Parks announced that they will install a first-of-its-kind public toilet facility at Smale Riverfront Park. The facility, often referred to as a ‘Portland Loo’ due to where it was first popularized, is an effort by city officials to come up with a more functional and affordable public restroom option. The idea of installing such facilities throughout Cincinnati first came up in June 2011 when then political activist Jason Happ proposed them as a form of social equity. The issue came up again following the renovation of Fountain Square, and the subsequent frequent closures of the public restrooms built near the elevator head house next to Via Vite. The issue resurfaced recently when community leaders, including City Councilman Chris Seelbach (D), called for the installation of a Portland Loo facility at Findlay Market. While project officials have designed permanent restroom facilities into Smale Riverfront Park, the new Portland Loo will give Cincinnati Parks the opportunity to see how such a facility works for their operations. The idea is that such a system would allow for more public access with fewer operational costs and risks. As of now, public restroom facilities in city parks are often closed or not fully operational. They also often are considered a public health and safety concern due to their design. Some of the biggest benefits of the Portland Loo system is that they are designed in manner that allows for 24-hour use and are easily monitored, cleaned and maintained. According to park officials, the improved safety is due to the angled lower louvers at the top and bottom of the facility, which allows for external monitoring of what is happening inside without disturbing the occupant’s privacy. They also say that the facility will be covered in graffiti-proof coating. The new facility at Smale Riverfront Park will come online June 19 and will feature an outside hand-washing station, rooftop solar panels to power the station’s lights, and will be handicap accessible and include room for a bike or stroller. Using just 1.28 gallons of water per flush, the toilets are also comparable to sustainable low-flush toilets that use anywhere between 1.1 to 1.6 gallons of water per flush. Should the results of this first installation come back positive, it would seem likely that the City of Cincinnati would revisit the idea of installing one at Findlay Market where its bathroom facilities are also considered to be problematic. Beyond that, several other parks and neighborhood business districts might be ideal candidates for further expansion. On the 47th episode of The UrbanCincy Podcast, Northside neighborhood leader James Heller-Jackson discussed the hopes the community has for improving Jacob Hoffner Park in the heart of the neighborhood’s resurgent business district. 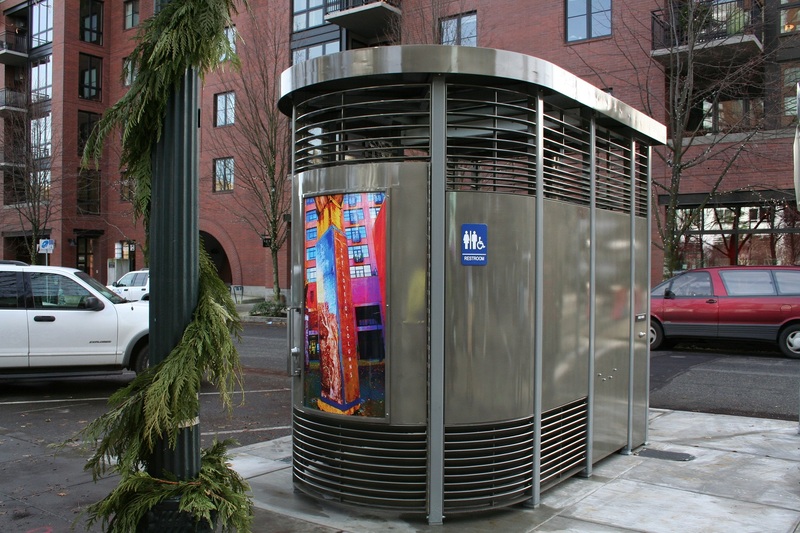 For now, however, the first Portland Loo will be put to the test along the central riverfront. Carden says that Cincinnati Parks will then assess if and when additional Portland Loos will be added to other parks in the system.